Newscast Media HOUSTON, Texas —	Soldiers and school teachers are perhaps some of the most important people in society but are rarely recognized or acknowledged for their services. In a time of endless wars where soldiers are put in life-or-death situations, Newscast Media wants to take time to honor our brave men and women serving on the front lines. The video below is the full rendition of Houstonians annually honoring the U.S. Military including the Navy, Airforce, Marines, National Guard and War Veterans honored for their service to this country. 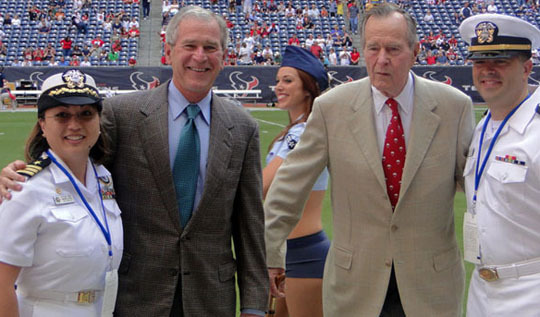 Among the special guests who regularly honor our troops were George H. W. Bush and George W. Bush who mingled with the soldiers and took photographs at Houston's Reliant Stadium.